In September some children in our school started taking recorder lessons with Ms. McGree, many of them had never played the instrument before. At the beginning of May they performed for their parents to mark the end of the year of recorder lessons. We were amazed by their progress. We created a video of a small selection of the songs they performed. Well done to the children for all their hard work and the huge progress they made during the year and thanks to Ms. McGree for her time and commitment working with them. Last Saturday in DCU our school was crowned Leinster Mathletes champions for 2015 and All Ireland runners up. All the children from 4th, 5th and 6th class took part in the Mathletes programme this year and this award is richly deserved for all the time and effort they put in working on Khan Academy in school on our Ipads and at home on their laptops. Well done also to all the parents for encouraging their children to work so hard on this initiative. 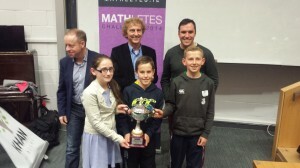 Congratulations also to the 15 children selected this year for the Leinster MATHletes individual playoffs and especially to Ciarán Rice who qualified for the All Ireland MATHletes finals where he competed against the top 20 6th class MATHletes students from all over Ireland. Unfortunately he was unable to retain his crown but we are still very proud of his achievement. The school received an All Ireland runners up trophy and an ipad mini for our school to help us to continue to work hard on Khan Academy.